The fact that drones are not just for fun is well-known to almost everyone. People gradually start using these devices in different life spheres. In this article, we will discern about the ways of using drones in the military purposes and analyze the latest achievement of Aerovironment. Recently, Aerovironment, the main drone supplier for the U.S. military, amazed the society by its main achievement – a small drone which can be fixed to the soldier’s uniform. This company is regarded to be the leading manufacturer of tiny Unmanned Aircraft Systems for US military forces. This small drone is called the Snipe. Its overriding priority is to cater for the needs of US army. Its weight is not more than the weight of a baseball. It was developed with the aim to provide soldiers with the aerial video material. This drone will be an irreplaceable tool for every soldier who wants to have the better understanding of the situation around. According to the information, presented on the official website of the company manufacturer, we can say that the Snipe Nano UAS is the newest unmanned aircraft system innovation which provides the army with the most detailed information about everything which happens around them. The weight of the Snipe is less than 5 ounces (140gr). The users can start using them in less than 1 minute, the additional assembly is not required. The drone provides the troops with the tactical overwatch which lasts for 15 minutes. There is no need to spend lots of time learning how to use this device. The drone is very easy to use. There is a special screen tablet and users can control it manually. The device is empowered with an electro-optical and infrared camera. Due to this, the drone can transmit video during day or night operations. The average speed of Snipe is 33 mph. Besides, one of the greatest benefits is that the Snipe is virtually inaudible at 100 feet AGL. This feature is crucially important for all soldiers because sometimes such operations affect their safety. As you see, people start using drones not for fun only. Except for military purposes, people can use drones for racing, aerial inspections, shipping, spying, hunting, saving lives or transportation. On that score, we can say that very soon drones will not be anything new or strange for the society. 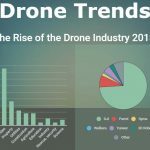 Each drone manufacturer works on the development of new technologies. 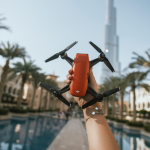 Every year or even more often we see that new models and new accessories to drones hit the market and all the time they are better than the previous ones. If you are a drone enthusiast or a professional user, who is constantly searching for the latest drone achievements welcome to aeromotus.com. We are the best DJI dealer, offering for sale a number of DJI products.